Online casinos offer many features that land based casinos aren’t equipped to offer, but that doesn’t mean we’re not all for a night out at the casino every now and then. New Zealand’s major cities boast some world-class brick and mortar casinos, providing a great platform for a night out with friends to celebrate a special occasion or to try your luck on the roulette, blackjack or poker tables. For those nights where online gaming just won’t cut it, we’ve provided a guide to best land based casinos in New Zealand. New Zealand casinos don’t have quite as colourful a history as some other countries like the United States, but like most other countries, the industry is not without its controversy. Gambling first began to thrive in New Zealand with the introduction of European settlers and despite being classified as illegal, it continued to grow in popularity during the colonial era. It wasn’t until the Gambling Act of 1908 was established that betting on races became the first form of legalised gambling in the country. The legal Golden Kiwi Lottery was later introduced in 1961, paving the way for the introduction of the New Zealand Lotteries Commission in 1987, and the thriving lotto, scratchies and keno industry that exists in New Zealand today. Casinos came later, after pokies (electronic slot machines) were introduced in the early 1990s. While the pokies were originally only offered in pubs and clubs with revenue benefitting charitable organisations, the demand grew as more people enjoyed the no-skill-required nature of these games, and by 1994, New Zealand’s first land based casino opened its doors in Christchurch. Six casinos now operate in Christchurch, Auckland, Queenstown, Wellington and Dunedin, with pokie machines found in clubs and pubs around the country. All forms of gambling in New Zealand are now governed under the laws of the Gambling Act 2003. Be aware that while the minimum age to purchase alcohol in New Zealand is 18, individuals must be at least 20 years old to enter a casino. You can read more about New Zealand’s online gambling laws here. 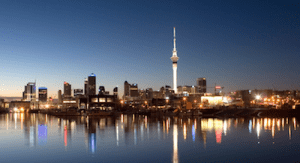 SKYCITY Auckland is the only land based casino in New Zealand’s capital city and is the biggest casino in the country. It is open 24 hours, seven days a week (with restricted hours on Christmas, Good Friday and ANZAC Day) in the centre of the CBD. This is a world class entertainment complex, offering a fully integrated casino experience including hotels, a variety of bars and restaurants, a convention centre and the famous Sky Tower which provides 360 degree panoramic views over the city. The Auckland Casino offers over 1,700 electronic gaming machines and 130 table games, including roulette, blackjack, baccarat and poker. Several VIP gaming rooms are available for high rollers. The Christchurch Casino was New Zealand’s first casino and remains highly popular to this day. Located in the heart of the busy Victoria Street, Christchurch Casino hosts over 500 electronic gaming machines and 36 table games, including Caribbean Stud poker, baccarat, three card poker, lunar poker, blackjack and Tai Sai. Rapid Roulette and the Money Wheel are also available for those who like their luck based games with a twist from the usual pokies. The Christchurch Casino is also home to the New Zealand Poker Championships and to the exclusive VIP gaming room, Club Aspinall, which can be accessed via invitation only. There are two land based casinos operating in Queenstown – SKYCITY Queenstown and the SKYCITY Wharf Casino. 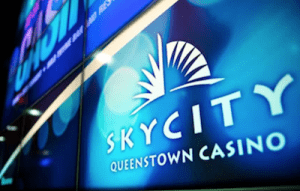 Both owned by the same entertainment group, they offer the same high standard of service and gaming, but SKYCITY Queenstown is the major gambling destination and is open 24 hours a day, while SKYCITY Wharf Casino provides a more boutique gaming experience and only operates between 11AM and 2AM. SKYCITY Queenstown offers over 86 electronic gaming machines and eight table games including baccarat, blackjack, roulette and Caribbean Stud poker, as well as VIP gaming in the beautifully appointed Horizon Room. The Wharf Casino is licensed to operate 74 gaming machines, six gaming tables and does not offer a VIP gaming area. SKYCITY Hamilton is one of the major casinos operating on the North Island of New Zealand. It offers 330 electronic gaming machines and 23 table games, including baccarat, blackjack, Caribbean Stud poker, three card poker, Ultimate Texas Hold’em, roulette and the Money Wheel. For those who want to place higher wagers, Salon 8 offers higher table game limits and more privacy, while the Diamond Lounge offers premium services and hi-stake electronic games to VIP players. SKYCITY Hamilton also offers multiple bars and restaurants and a 600-person capacity convention centre overlooking the Waikato river. Dunedin Casino opened in 1999, offering visitors “unparalleled entertainment experience with breathtaking interior features and opulent gaming rooms.” One of the two casinos in New Zealand not run by the SKYCITY Group, Dunedin Casino is a stand-alone gaming venue that aims to replicate the grandeur of yesteryear, offering 180 electronic games and a variety of table games in a first-class gaming environment. The casino is open from 11AM to 3AM daily and is just a short walk from the city centre known as the Dunedin Octagon. Playing at an online casino offers many advantages over heading out to a land based casino. Firstly, with many New Zealanders living in rural or suburban locations, it’s not always viable to play at a bricks and mortar casino. Online casinos are accessible 24/7 to anyone over the age of 18 who has access to a computer, tablet or smartphone with an Internet connection. Secondly, online casinos can come in handy to familiarise yourself with games, learn new rules and hone your skills before you hit the gaming tables at a land based casino. Casino games online can be trialled for free in demo mode, so you can get a hang of games without having to lay down any of your hard-earned NZD. Online casinos offer a huge selection of classic and rare games, with some excellent bonus offers available for new players. While it is illegal to operate an online casino within New Zealand, many of the leading offshore casino sites happily accept real money players from New Zealand. When choosing an online casino site, make sure you stick with reputable venues that are legally licensed by trustworthy online gambling jurisdictions and protected by a minimum of 128 Bit SSL digital encryption security. Our site has been geo-targeted to recognise your location and only recommend safe online casinos that cater to Kiwis, so you can use any of our links to sign up for an account and play for real money using NZD. It’s important that you understand the New Zealand online gambling laws that apply to you. If you’re new to the world of online casinos, read our beginners guide to gambling online.